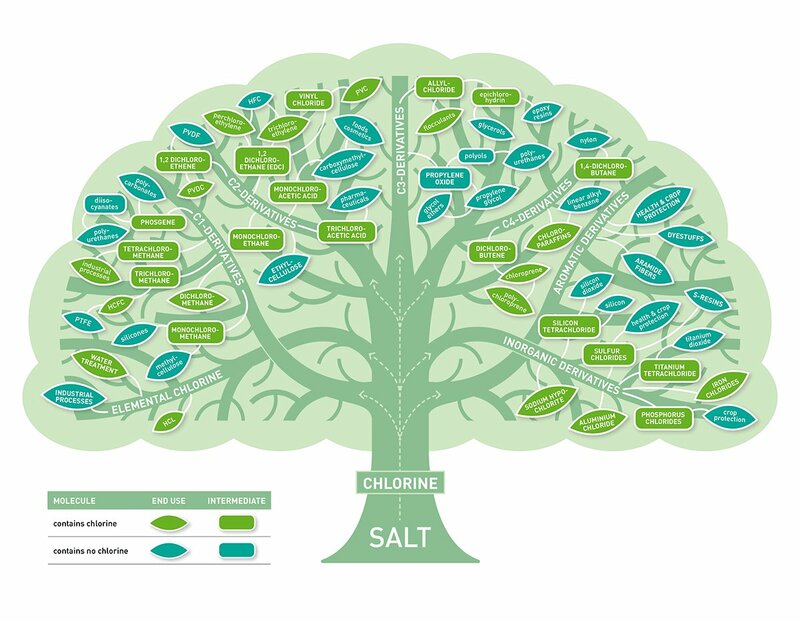 This illustration depicts the uses of chlorine in both end-products and as an intermediary in the production of others materials. “Poison Plastic,” “Toxic Plastic,” or “Pandora’s Poison”: There is no shortage of unsavory monikers used to describe polyvinyl chloride (PVC) and the vinyl products made from it. Few materials have been vilified as much as PVC, which has come under fire by the green building community over the last twenty years for containing hazardous materials and releasing toxic chemicals during manufacture, use, and disposal. All the while, the PVC industry, buoyed by incredible demand for the material, argues that complaints are exaggerated and emphasizes that it is made from “common salt”—implying that it is harmless. Let’s take a look at the history of PVC in the building industry, the realities of PVC production in 2014, and how this decades-long debate has informed our view of building products in general. PVC is an extremely versatile plastic resin. It is found in pipe, wire insulation, flooring, window frames, wallcoverings, carpet backing, and a host of consumer products. It can be formulated to be rigid or flexible, clear or opaque, and finished products made from PVC are lightweight, inexpensive, durable, and UV-, chemical-, and corrosion-resistant. This versatility has helped make PVC the third most widely used plastic in the world behind polyethylene (PE) and polypropylene (PP). PVC was first synthesized in its raw form in 1835, but it wasn’t until the creation of flexible, or plasticized, versions in the late 1920s that PVC was made into functional products. It was used as a rubber substitute in World War II and in building and consumer goods after the war. Worldwide, about three million tons of PVC were produced in 1965. And “approximately 7.5 million tons were produced in the U.S. alone in 2012, with more than 70% of that used in the building and housing industries,” according to Allen Blakey, vice president of industry and government affairs at the Vinyl Institute. Through the 1960s, PVC production—like many industrial processes—was not considered particularly hazardous. Vinyl chloride, the “monomer” known as VCM and the primary ingredient of PVC, was even used as an aerosol propellant in hairspray. All this changed in the 1970s, when exposure to VCM was linked to the liver cancer angiosarcoma in workers in PVC plants. The U.S. Food and Drug Administration soon banned its use in consumer goods, and Occupational Safety and Health Administration (OSHA) regulations limited worker exposure, which forced the PVC industry to redesign its production process to reduce emissions. PVC became the most scrutinized building material—even more so in the 2000s when, at the urging of its membership, the U.S. Green Building Council (USGBC) considered a credit for its LEED rating systems that would have discouraged PVC use. USGBC reported in 2007 that other materials can be worse than PVC (depending on the application) and that an across-the-board ban could be counterproductive; but that didn’t put an end to concerns, particularly in regard to other ingredients in PVC products, such as heavy-metal stabilizers and phthalate plasticizers. PVC is now restricted in hospitals run by Kaiser Permanente, and green building programs such as Cradle to Cradle and the Living Building Challenge have banned it via red lists. 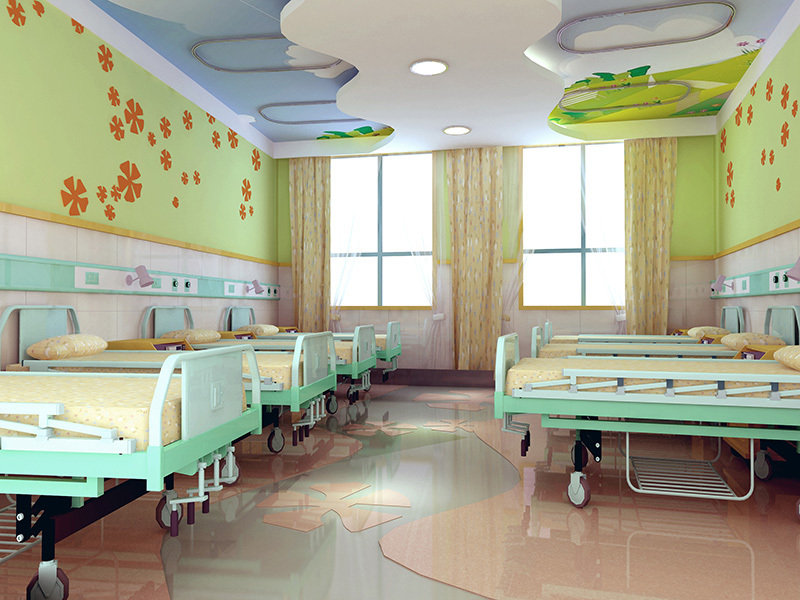 Vinyl, which is inexpensive, durable, and easy to sanitize, was used on the flooring, wallcovering, and ceiling mural of this children’s hospital wing. Other hospitals, most notably those owned by Kaiser Permanente, have banned PVC use due to concerns over phthalate plasticizers and life-cycle impacts.